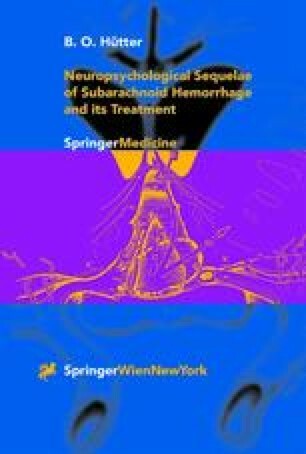 When leafing critically through the scientific literature, it becomes obvious that the frequency and severity of emotional disturbances and personality changes as a consequence of SAH are out of proportion to the, on average rather moderate, cognitive and neurological impairments of these patients (Hütter, 1998; Hütter, Kreitschmann and Gilsbach, 1995; Stegen and Freckmann, 1991; Vilkki et al., 1990; Bornstein et al., 1987; Ljunggren et al., 1985). This discrepancy can also not be explained by a psychological reaction on persisting functional deficits or the social stigma associated with “to have had trouble with the head”. Therefore, the question about the possible causes for the psychological abnormalities occurring after SAH arises.